You are here: Home » MEDIA » Books » The Long Cosmos (Long Earth Cycle book 5) by Terry Pratchett & Stephen Baxter (book review). 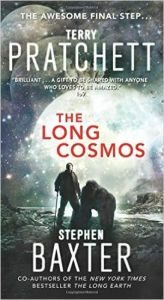 The Long Cosmos (Long Earth Cycle book 5) by Terry Pratchett & Stephen Baxter (book review). ‘The Long Cosmos’ by Terry Pratchett & Stephen Baxter is the fifth and final book of the ‘Long Earth’ cycle. The Long Earth being a multitude of alternate Earths devoid of human life. Our world is called Datum Earth to distinguish it from the others. Until step day that is, almost 55 years ago, when the plans for a simple device called a stepper were published and many people stepped for the first time into the Long Earth. Mankind has since then fled Datum Earth completely because the Yellowstone event had made it nearly uninhabitable and spread out into the Long Earth. This novel, like its precursors, has the theme of journeys at its heart. Joshua Valienté goes on one last trip through the Long Earth for a final adventure before he becomes too old. While traveling alone, he learns that his estranged son has gone missing. Joshua’s priorities are quite clear. Nelson Azikiwe and Maggie Kauffman go on their own personal journeys which reveal some more aspects of the Long Earth. Meanwhile, all intelligent life-forms on the Long Earth receive a message by various means. It simply says: ‘JOIN US’. This leads to the Next and the humans working together to find out more about the message. Soon, the Next discover building plans encoded in the message which lead to the biggest joint project on the Long Earth ever: a travelling device. What will they find when they start following the message? ‘The Long Cosmos’ does not give the readers all the answers but it is certainly a fitting conclusion for this series of travelogues brimming with excursions into a fantastic universe. The storylines of all the main protagonists come to a satisfying end. Despite characterisation not being an important part of the novels, the protagonists are well enough developed to serve the story and to be easily distinguishable. ‘The Long Cosmos’ explores a few new themes and ideas and expands further on the old ones. It broadens our view on the Long Earth universe some more. Do not look here for deep characterisation or lots of action. If you want to read a good SF yarn containing lots of ideas, you cannot go wrong with this series. The very distinctive writing styles of the two authors never become a problem. The voices of the late Terry Pratchett and Stephen Baxter blend as seamlessly in this novel as in all the previous books published in the series. Universes by Stephen Baxter (book review). « The Ninth Rain (The Winnowing Flame Trilogy book 1) by Jen Williams (book review).